It’s been a long time since the last update to the Valcartier Crowdsourcing Project but I’m pleased to report that nine additional officers have been identified. All but two are artillerymen and many are familiar names to those of us who have an interest in the First World War. I’d like to thank Susan Raby-Dunne and Robert Paterson for taking the time to scrutinize hundreds of faces and for passing their findings on to me. Susan’s keen eye was well suited to the task as her latest book, “Morrison: The Long-Lost Memoir of Canada’s Artillery Commander in the Great War“, was published last November and is a must-read! 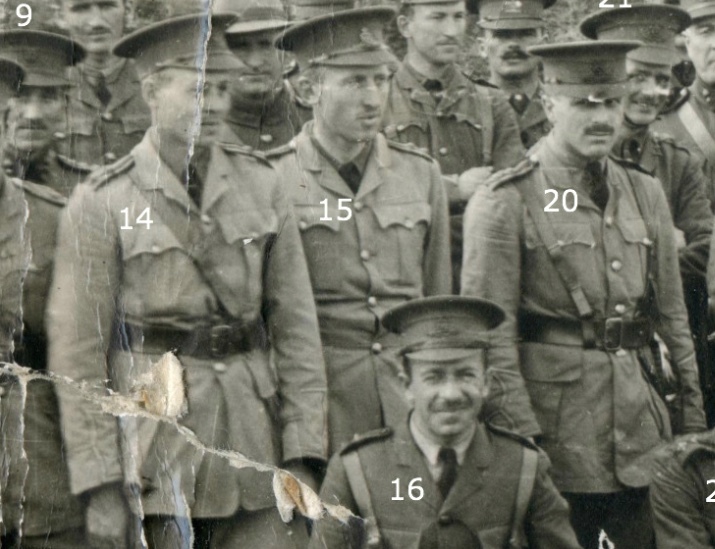 Robert Paterson has a personal connection to one of the officers in the photo and was able to identify his grandfather, Lt. Alexander Paterson, along with two other artillery officers including Major Andrew McNaughton. 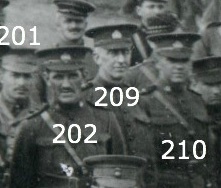 The rank and unit associated with each officer listed below was taken from nominal rolls prepared several weeks after the photograph was taken. 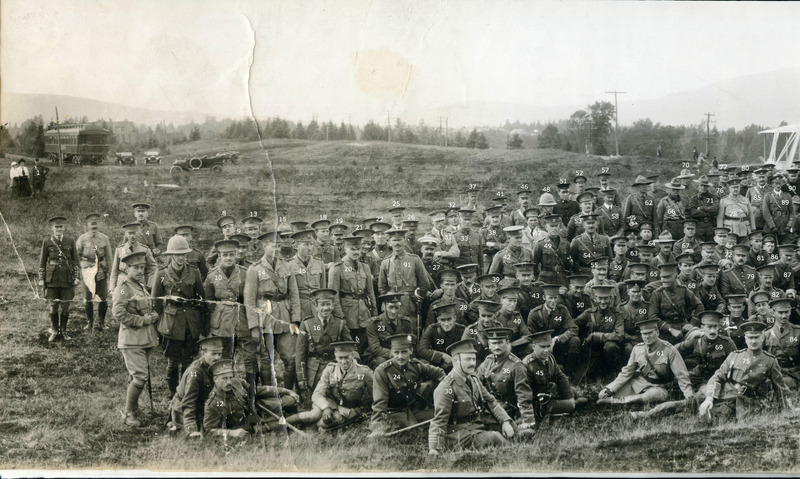 If you think you recognize an officer in the Valcartier panoramic photograph please leave a comment below or contact me. Thanks in advance. #5 – Brigadier-General Richard Ernest William Turner VC, Boer War hero and commander of the 3rd Brigade, 1st Canadian Division at the start of the First World War. He was knighted in 1917 and by war’s end was a Lieutenant-General appointed as Chief of the General Staff, Overseas Military Forces of Canada. 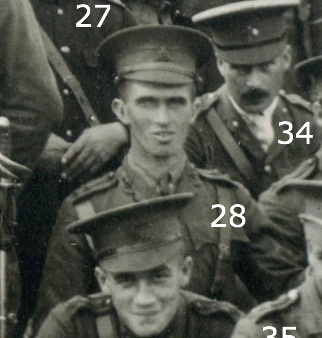 #6 – Lt. Owen Carsley Frederic Hague served in the 2nd Brigade, Canadian Field Artillery and was killed alongside Lt. Alexis Helmer on May 2nd, 1915 while checking a gun battery positioned on the bank of the Yser Canal. #14 – Lt. Alexander Thomas Paterson, 2nd Brigade, Canadian Field Artillery. Alex attended the Royal Military College and served in the Westmount Battery at the Craig St. Armoury in Montreal. He was a close friend of Andrew McNaughton and Arthur Currie and went on to serve as a Colonel in the Second World War. #20 – Major Andrew McNaughton, 2nd Brigade, Canadian Field Artillery. McNaughton rose to the rank of Brigadier-General at the end of the First World War and briefly led the Canadian First Army in the Second World War. In 1944 he became the Minister of Defence, a post he held until August 1945. #28 – Lt. Alexis Helmer, 1st Brigade, Canadian Field Artillery. Helmer attended the Royal Military College and was a good friend of Major John McCrae. On May 2, 1915 Helmer died alongside Lt. Owen C.F. Hague while inspecting a gun emplacement on the Yser Canal. McCrae conducted the funeral service and shortly thereafter wrote the first draft of “In Flanders Fields”. #69 – Lt. Lawrence V.M. Cosgrave, 1st Brigade, Canadian Field Artillery. Cosgrove finished the war a Lt-Colonel with a DSO and bar as well as two Croix-de-Guerres to his name. In 1911 he suffered a detached retina in his left eye during a boxing match, an injury compounded by a concussion he suffered at Arleux in 1917. This disability may have played a part in an incident that took place in the Second World War when, given the responsibility of signing the Japanese Instrument of Surrender on behalf of Canada, he (in)famously signed on the wrong line. 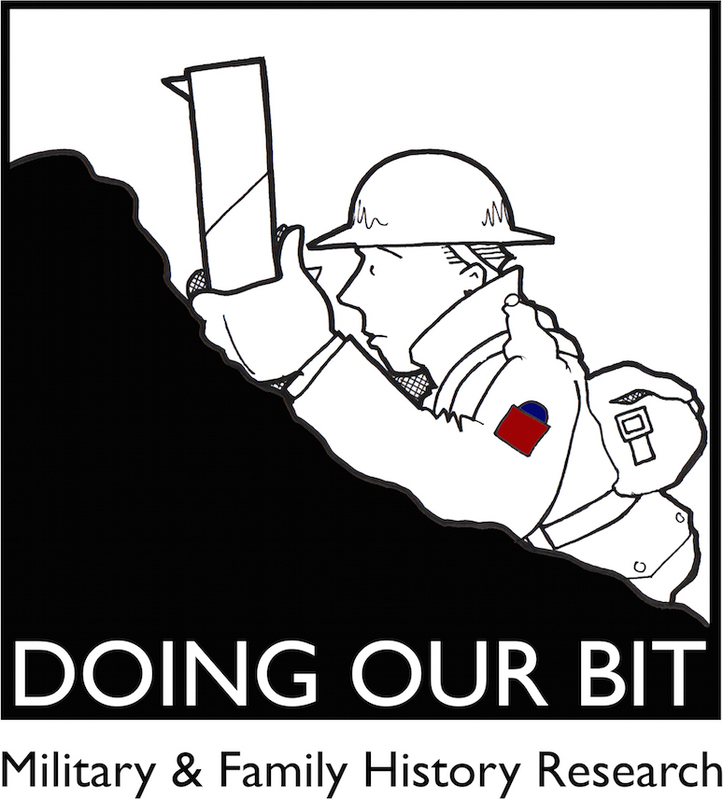 #75 – Lt-Col. Edward W.B. Morrison, 1st Brigade, Canadian Field Artillery. Morrison served as a Lieutenant in the Boer War, earning a DSO and writing a book about his experiences entitled “With the Guns in South Africa“. At the start of the First World War Morrison was in command of the 1st Brigade, CFA however in September 1915 he was promoted to Brigadier-General and took over the 1st and then 2nd Canadian Divisional Artillery. In late 1916 he was in command of the entire Canadian Artillery and ended the war a Major-General, having participated in every major battle that the Canadians were involved in. #84 – Maj. Charles H. MacLaren, 1st Brigade, Canadian Field Artillery. 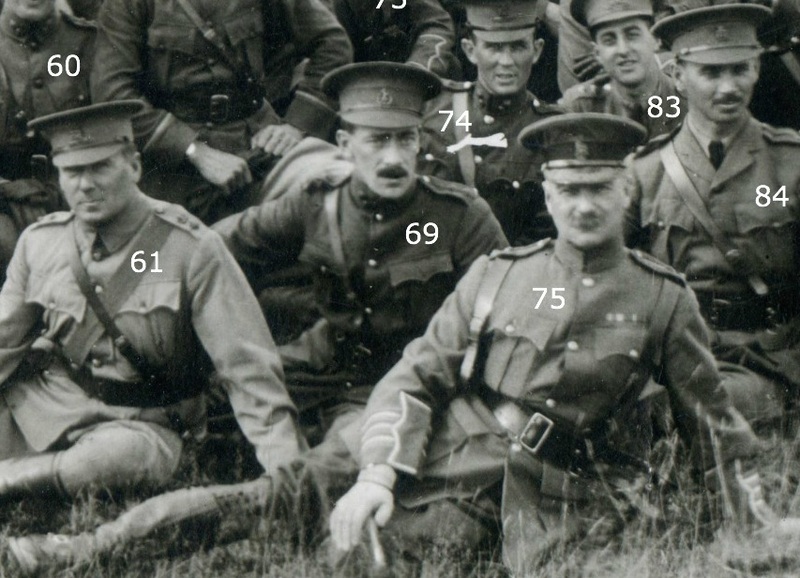 In August 1915 MacLaren was promoted to Lt-Col. and in command of the 1st Brigade, C.F.A.. He rose to Brig-General but fell ill in November 1917 and was invalided to England where he commanded headquarter units for the remainder of the war. #209 – Capt. (Chaplain) Frederick G. Scott. Scott enlisted with the Canadian Chaplain Service at Valcartier and was initially attached to the 14th Battalion (Royal Montreal Regiment). He later became Senior Chaplain in the 1st Canadian Division and rose to the rank of Hon. Lt-Colonel. He was wounded by shrapnel at Cambrai in September 1918. In his post-war book, “The Great War As I Saw It” he described his appearance at Valcartier: “I was clad in a private’s uniform, which was handed out to me out of a box in the drill-shed the night before the 8th Royal Rifles left Quebec, and I was most punctilious in the matter of saluting General Hughes whenever we chanced to meet.” This description fits the officer labelled #209. Number 61 is Lieutenant-Colonel William Okell Holden Dodds Love this project!